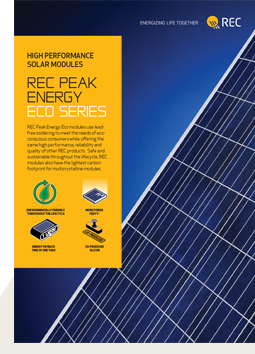 REC Peak Energy Eco Series solar panels are based on lead-free soldering in an innovative step in the manufacturing process. REC has significantly reduced the lead content in the REC Peak Energy Eco Series to meet the needs of more eco-conscious consumers. The REC Peak Energy Eco Series solar panel provides the same high performance and reliability as other panels in the REC Peak Energy Series, producing more energy per watt peak than other leading brands. With the lightest carbon footprint for multicrystalline solar panels, REC products are safe and sustainable throughout their lifecycle and deliver an industry-leading energy payback time of one year.